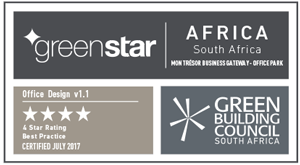 As part of the Mon Tresor Smart City, the Mon Trésor Business Gateway (MTBG) – Office Park is developed around a ‘Live-Work-Play’ concept in line with the Smart City Scheme and has been awarded a 4 Star Green Star Office v1.1 rating by the GBCSA. 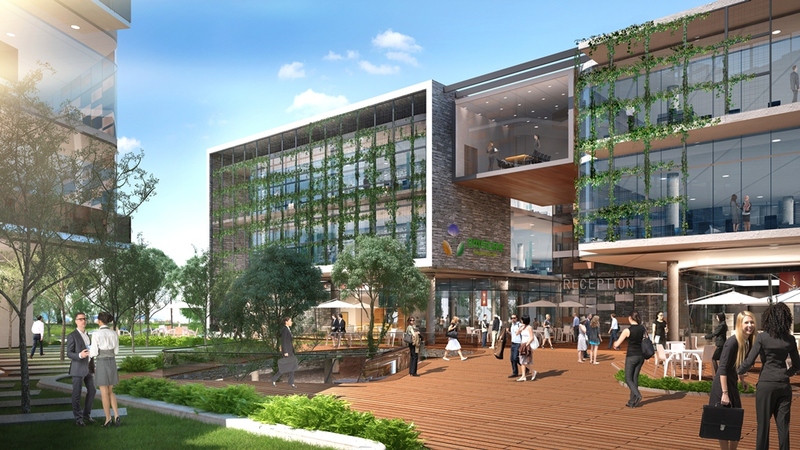 The MTBG office has incorporated environmental and sustainable practices from its design to its construction and has specifically been designed to give our people the workplace to enhance not only their productivity but also reduce the natural resource depletion on the environment. 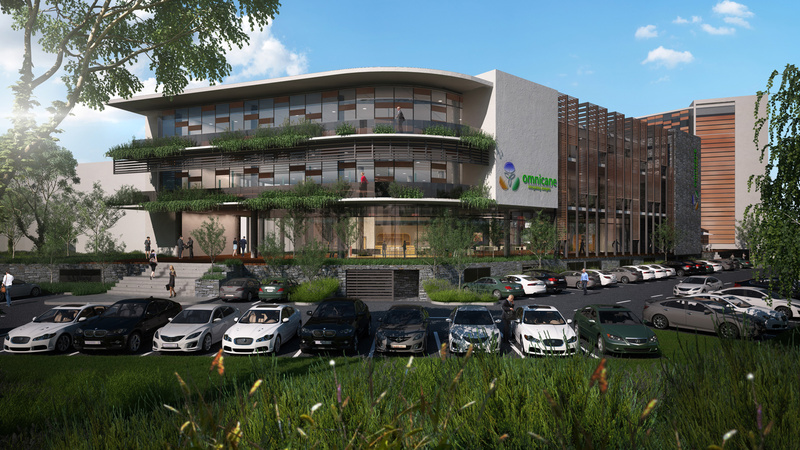 The building compromise of a basement level, a podium level and three office blocks, all complete with roads, infrastructure, external works, hard landscaping and all ancillary and related facilities. Two blocks consist of Ground Floor, first floor and second floor whereas the third bloc consists of Ground floor, First Floor, Second Floor, Third Floor and Fourth Floor. The Usable Area of the project is 11,629m2 and the GFA is 13,493m2 excluding car parking areas. The construction consists of substructure, concrete work, blockwork, roofing works and related finishes including all related external infrastructure works and MEP services. A majority of the space is open plan due the nature of works. The air flow and direction has been taken into consideration with regards to potential noise levels. More than 90% of all structural steel has a recyclable content. Parking spaces for fuel efficient and 2 wheeled vehicles have been provided. All works will be carried out by the Principle building Contractor. Fixed external shading as well as internal blinds have be fitted. The building has been fitted with an integrated BMS system. The heating ventilation and air conditioning system is a cooled air system. Making use of minimal water usage. Fresh air rate is supplied at 12.5l/s/person for 100% of the usable area. Water closets, urinals and tape fixtures all reduce water consumption. WC’s and urinals all fitted with actuators to reduce and control water consumption. Sub-meters are installed for substantive energy uses of 1100kVA or more and separately for lighting, power and HVAC in each distribution board on each floor. The sub-meters are linked to the 0BMS for the monitoring of energy consumption. Secured bicycle bays and changing facilities/lockers are provided for staffs and parking bays for visitors. Convenient cycling routes are provided between the office development and the adjacent street network as well as specific signage. Integrated BMS system records and logs the all energy and water usage within the building and can be displayed in real time.